Stillhouse Hollow Sailing club has a Bridge Too Far race every spring, and it is my favorite race. It starts at the marina near the dam, then someyears around a buoy, and up the lake around the buoy at the boat ramp by the bridge, and back to the marina. The course is over 20 miles, so a lot of things can happen, and usually do happen in this usually windy race. It's a good test of sailing on all points of sail, as the lake winds back and forth to the bridge. With time corrected by the Portsmouth handicap, boats of all sizes can race. This year we had boats from Sunfish to a Hunter 28.5, and three Hobie catamarans. It was a fast race in 2007, with winds 10-15 mph and gusts to 20 boats started finishing in 3 hours and 6 minutes. 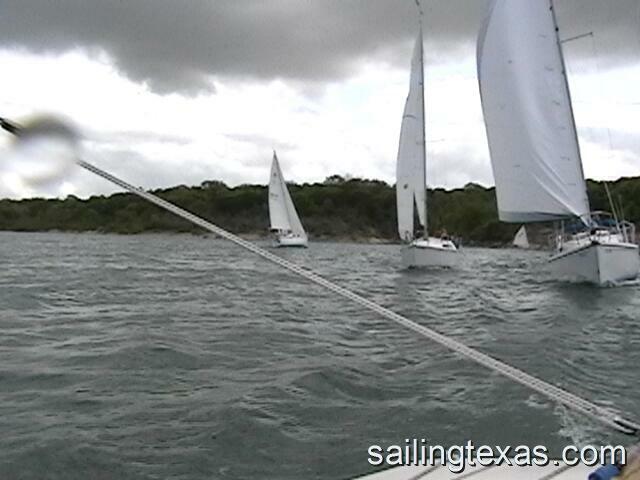 Race started at high noon, and we all tacked out the narrow marina cove for the upwind leg to buoy E. One of the Hobies and Felipe Payet in his Laser 2 led the way out of the cove, with Alison, Dusty and I in third. Felipe and the Hobie pulled away, while I kept rounded the mark third. Heading up the lake, the Hobie in the lead headed the wrong way, and Felipe followed, allowing us to pass them. We held onto the lead on the leg to the bridge, but after rounding the mark the Hobie 17 passed us, then the Hobie 18, and then the Hobie 16 so we were down to 4th. Rick Powers in his MC16 stayed close behind us the whole race, along with Jim and Steve in the two Sunfish. Almost in sight of the dam, the Hobie 18 flipped, and the other two Hobies went to help, sacrificing their lead. Jim Brown, Sunfish, First Place!